The economy has been crippled by debt. You’d have to be insane to want to invade Syria. They’re just blind to the suffering of other people. Only a moron would believe that. Disability metaphors abound in our culture, and they exist almost entirely as pejoratives. You see something wrong? Compare it to a disabled body or mind: Paralyzed. Lame. Crippled. Schizophrenic. Diseased. Sick. Want to launch an insult? The words are seemingly endless: Deaf. Dumb. Blind. Idiot. Moron. Imbecile. Crazy. Insane. Retard. Lunatic. Psycho. Spaz. I see these terms everywhere: in comment threads on major news stories, on social justice sites, in everyday speech. These words seem so “natural” to people that they go uncritiqued a great deal of the time. I tend to remark on this kind of speech wherever I see it. In some very rare places, my critique is welcome. In most places, it is not. When a critique of language that makes reference to disability is not welcome, it is nearly inevitable that, as a disabled person, I am not welcome either. I might be welcome as an activist, but not as a disabled activist. I might be welcome as an ally, but not as a disabled ally. I might be welcome as a parent, but not as a disabled parent. That’s a lot like being welcomed as an activist, and as an ally, and as a parent, but not as a woman or as a Jew. Many people have questions about why ableist speech matters, so I’ll be addressing those questions here. Please feel free to raise others. 1. Why are you harping so much on words, anyway? Don’t we have more important things to worry about? The stories that disability metaphors tell are deeply problematic, deeply destructive, and deeply resonant of the kinds of violence and oppression that disabled people have faced over the course of many centuries. They perpetuate negative and disempowering views of disabled people, and these views wind their ways into all of the things that most people feel are more important. If a culture’s language is full of pejorative metaphors about a group of people, that culture is not going to see those people as fully entitled to the same housing, employment, medical care, education, access, and inclusion as people in a more favored group. 2. What if a word no longer has the same meaning it once did? What’s wrong with using it in that case? Ah yes. The etymology argument. When people argue word meanings, it generally happens in a particular (and largely unstated) context. 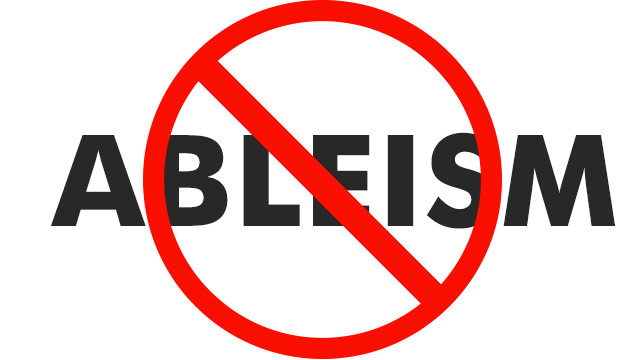 With regard to ableist metaphors, people argue that certain meanings are “obsolete,” but such assertions fail to note the ways in which these “obsolete” words resonate for people in marginalized groups. For example, I see this argument a great deal around the word moron, which used to be a clinical term for people with an intellectual disability. I have a great-aunt who had this label and was warehoused in state hospitals for much of her brief 25 years of life. So when I see this word, it resonates through history. I remember all of the people with this designation who lived and died in state schools and state mental hospitals under conditions of extreme abuse, extreme degradation, extreme poverty, extreme neglect, and extreme suffering from disease and malnutrition. My great-aunt lay dying of tuberculosis for 10 months under those conditions in a state mental hospital. The term moron was used to oppress human beings like her, many of whom are still in the living memory of those of us who have come after. Moron — and related terms, like imbecile and idiot – may no longer be used clinically, but their clinical use is not the issue. They were terms of oppression, and every time someone uses one without respect for the history of disabled people, they disrespect the memory of the people who had to carry those terms to their graves. 3. What’s wrong with using bodies as metaphors, anyway? Think about it this way: Consider that you’re a woman walking down the street, and someone makes an unwanted commentary on your body. Suppose that the person looks at you in your favorite dress, with your hair all done up, and tells you that you are “as fat as a pig.” Is your body public property to be commented upon at will? Are others allowed to make use of it — in their language, in your hearing, without your permission? Or is that a form of objectification and disrespect? In the same way that a stranger should not appropriate your body for his commentary, you should not appropriate my disabled body — which is, after all, mine and not yours — for your political writing or social commentary. A disabled body should not appear in articles about how lame that sexist movie is or how insane racism is. A disabled body should be no more available for commentary than a nondisabled one. The core problem with using a body as a metaphor is that people actually live in bodies. We are not just paralyzed legs, or deaf ears, or blind eyes. When we become reduced to our disabilities, others very quickly forget that there are people involved here. We are no longer seen as whole, living, breathing human beings. Our bodies have simply been put into the service of your cause without our permission. 4. Aren’t some bodies better than others? What’s wrong with language that expresses that? I always find it extraordinary that people who have been oppressed on the basis of their physical differences — how their bodies look and work — can still hold to the idea that some bodies are better than others. Perhaps there is something in the human mind that absolutely must project wrongness onto some kind of Other so that everyone else can feel whole and free. In the culture I live in, disabled bodies often fit the bill. A great deal of this projection betrays a tremendous ignorance about disability. I have seen people defend using mental disabilities as a metaphor by positing that all mentally disabled people are divorced from reality when, in fact, very few mental disabilities involve delusions. I have seen people use schizophrenic to describe a state of being divided into separate people, when schizophrenia has nothing to do with multiplicity at all. I have seen people refer to blindness as a total inability to see, when many blind people have some sight. I have seen people refer to deafness as being locked into an isolation chamber when, in fact, deaf people speak with their hands and listen with their eyes (if they are sighted) or with their hands (if they are not). Underlying this ignorance, of course, is an outsider’s view of disability as a Bad Thing. Our culture is rife with this idea, and most people take it absolutely for granted. Even people who refuse to essentialize anything else about human life will essentialize disability in this way. Such people play right into the social narrative that disability is pitiful, scary, and tragic. But those of us who inhabit disabled bodies have learned something essential: disability is what bodies do. They all change. They are all vulnerable. They all become disabled at some point. That is neither a Good Thing nor a Bad Thing. It is just an essential fact of human life. I neither love nor hate my disabilities. They are what they are. They are neither tragic nor wonderful, metaphor nor object lesson. 5. I would never use the N-word because people of color are part of an oppressed group. Disabled people aren’t really oppressed. Are they? Yes, disabled people are members of an oppressed group, and disability rights are a civil rights issue. Disabled people are assaulted at higher rates, live in poverty at higher rates, and are unemployed at higher rates than nondisabled people. We face widespread exclusion, discrimination, and human rights violations. For an example of what some of the issues are, please take some time over at the Disability Social History Project. 6. If my disabled friend says it’s okay to use these words, doesn’t that make it all right to use them? Please don’t make any one of us the authority on language. It should go without saying, but think for yourself about the impact of the language you’re using. If you stop using a word because someone told you to, you’re doing it wrong. It’s much better if you understand why. 7. I don’t know why we all have to be so careful about giving offense. Shouldn’t people just grow thicker skins? For me, it is not a question of personal offense, but of political and social impact. If you routinely use disability slurs, you are adding to a narrative that says that disabled people are wrong, broken, dangerous, pitiful, and tragic. That does not serve us. 8. Aren’t you just a member of the PC police trying to take away my First Amendment rights? No. The First Amendment protects you from government interference in free speech. It does not protect you from criticism about the words you use. 9. Aren’t you playing Oppression Olympics here? No. I’ve never said that one form of oppression is worse than another, and I never will. In fact, I am asking that people who are marginalized on the basis of the appearance or functioning of their bodies — on the basis of gender identity, race, ethnicity, sexual orientation, class, size, age, and disability — get together and talk about the ways in which these oppressions weave through one another and support one another. If you do not want disability used against your group, start thinking about what you’re doing to reinforce ableism in your own speech. If you do not want people of color to be called feeble-minded, or women to be called weak, or LGBT people to be called freaks, or fat people to be called diseased, or working-class people to be called stupid — all of which are disability slurs — then the solution isn’t to try to distance yourself from us and say, No! We are not disabled like you! The solution is to make common cause with us and say, There is nothing wrong with being disabled, and we are proud to stand with you. 10. Why can’t we use disability slurs when the target is actually a non disabled person? To my knowledge, the president of the United States is not mentally disabled, and yet his policies have been called crazy and insane. Most Hollywood films are made by people without mobility issues, and yet people call their films lame. Someone who has no consciousness of racism or homophobia will be called blind or deaf to the issues, and yet, such lack of consciousness runs rampant among nondisabled people. So why associate something with a disability when it’s what nondisabled people do every single day of the week? As far as I can see, lousy foreign policy, lousy Hollywood films, and lousy comments about race and sexual orientation are by far the province of so-called Normal People. So come on, Normal People. Start owning up to what’s yours. And please remember that we disabled folks are people, not metaphors in the service of your cause. Frank, Arthur W. 2010. Letting Stories Breathe: A Socio-Narratology. Chicago, IL: The University of Chicago Press. The original post appeared on The Body Is Not An Apology and is reprinted by permission. More of Rachel Cohen-Rottenberg’s writing can be found on her website.